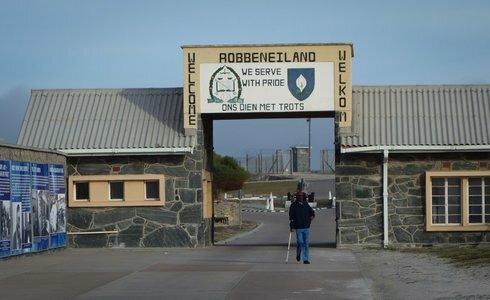 Robben Island, the unique symbol of - the triumph of the human spirit over adversity, suffering and injustice. The Island has a rich 500 year old multi-layered history. Visited by thousands every year, eager to understand and honour the important phases of South African history represented by the Island. Disembark at Murray's Bay Harbour situated on the east coast of the Island and take a short walk to buses that will transport you to all the historical sites around the Island. En route to the buses, you will pass buildings and a high wall built by prisoners during the 1960s. The buildings were used for family and lawyer visits to prisoners. Meet your tour guide on the bus. The tour guides inside the prison are former political prisoners. They are fully conversant and knowledgeable about the Island's multi-layered 500 year old history. The tour route includes the graveyard of people who died from leprosy, the Lime Quarry, Robert Sobukwe's house, the Bluestone quarry, the army and navy bunkers and the Maximum Security Prison where thousands of South Africa's freedom fighters were incarcerated for years. The tour culminates with a viewing of Nelson Mandela's cell.